Vintage Embossed Mobilgas Motor Oil Company Sign > Antique Old Gas Auto 9351. 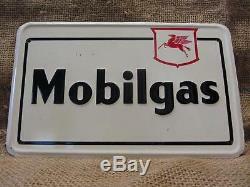 Vintage metal embossed Mobil Gas sign. This sign would look great in your mancave, get creative! The sign is 11 1/4" x 7" wide. Good condition for its age with minor dents. It has some minor to moderate scratches and areas of discoloration, see pictures. Also note that someone touched up the lower left corner with white paint, see pictures. See description above for further info on the condition. The item "Vintage Embossed Mobilgas Motor Oil Company Sign Antique Old Gas Auto 9351" is in sale since Sunday, June 7, 2015. This item is in the category "Collectibles\Advertising\Gas & Oil\Gas & Oil Companies\Mobil".